Seven persons injured in an accident involving a passenger car and cows numbering about 20 at Omi-Adio Ibadan end of the Ibadan-Abeokuta expressway on Monday. Are animals taking over with courage? First it was rats in the President's office and then money in the office of the Joint Admission and Matriculation Board found its way into the stomach of a snake. Cows went on rampage taking over the Akure airport runway and this is still fresh in the mind. Now, cows mounted a 'road block' at Ibadan-Abeokuta highway and it appears cows in Nigeria are on a mission to overthrow humans. Why can’t they dream big? After all, they are backed by human herders and their fellow humans and their government seem helpless already. About seven persons sustained serious injuries in an accident involving a passenger car and cows numbering about 20 at Omi-Adio Ibadan end of the Ibadan-Abeokuta expressway on Monday. According to eyewitness, immediately the accident occurred, a young Fulani man who was directing the cows called out the cows and ran away into the bush without caring for the life of the passengers in the wrecked Toyota car. 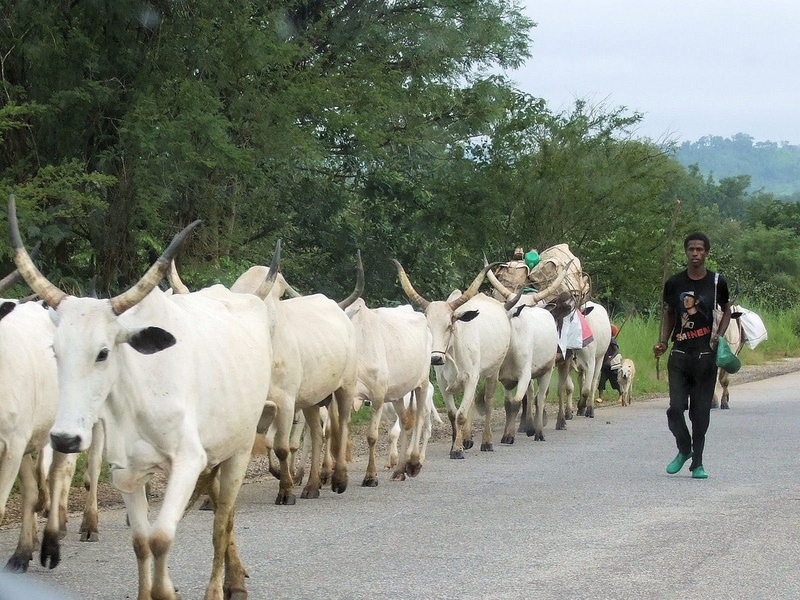 The cows, immediately, were said to have sped off in the direction of the herdsman into the bush, while sympathisers, mostly people from the surrounding villages pursued the Fulani man but could not trace him. Thankfully, no death was recorded in the mishap. The driver and six others were said to have been taken to a private hospital for treatment. One of the cows, which had knee injury, was also evacuated from the expressway to prevent it from causing more accident on the highway. Meanwhile, if not for the quick intervention of policemen, we could be writing about a bloody clash between the Fulani settlers and residents in the surrounding villages. Apparently, the host community is tired of the herders’ excesses. “It was a terrible scene. This is not the first time we have been witnessing accident by herdsmen who never listen to the warning not take their cows near the expressway. “God has been so kind to these passengers, they could have died. The vehicle was badly damaged and instead of making effort to save life, the Fulani man just called on his cows with their language and immediately the whole cows ran after him except the injured cow on the expressway. “This is very bad, something urgent must be done to avoid all this problem on the highway,” a villager who pleaded anonymity said.